Current epigenetic research encompasses studies on inheritance of stereotypic patterns of chromatin-associated histones and nonhistone proteins, their variant forms, modifications on the DNA as well as proteins and noncoding RNAs, relevant to nuclear-templated cellular events governing vertebrate gene function and differentiation. In recent years, the study of chromatin proteins and their interaction networks have evolved to grouping meaningful recurring marks into chromatin states. Major impetus in the study of chromatin states has been the outstanding improvements in analytical technology, including methodologies for efficient extraction of chromatin and its components, innovative preparatory chemistries, precision instrumentation, analytical layouts with better chemical discrimination, and retooled informatics capabilities. This chapter reviews some important recent developments in this growing field of interest and their potential for uncovering novel proteins and their modulatory roles in chromatin activity. We outline the global profiling of the most abundant of the chromatin proteins, the histones, and their modifications in several model organisms and cellular contexts, besides correlating particular histone marks and their turnover rates to specific chromatin states. 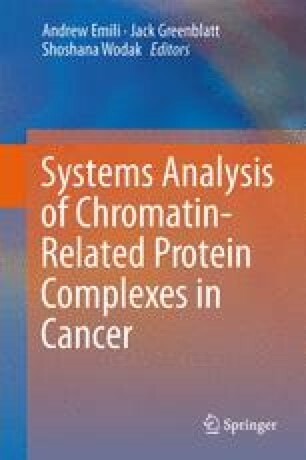 A whole nuclear proteome description delineating an integrated workflow for protein preparation, interrogation of chromatin states, and data analysis is illustrated.